Photo courtesy of Sam Walsh. To promote environmental sustainability, The Office of Sustainability at West Chester University implemented a “bike share” program across campus through a company called Zagster. 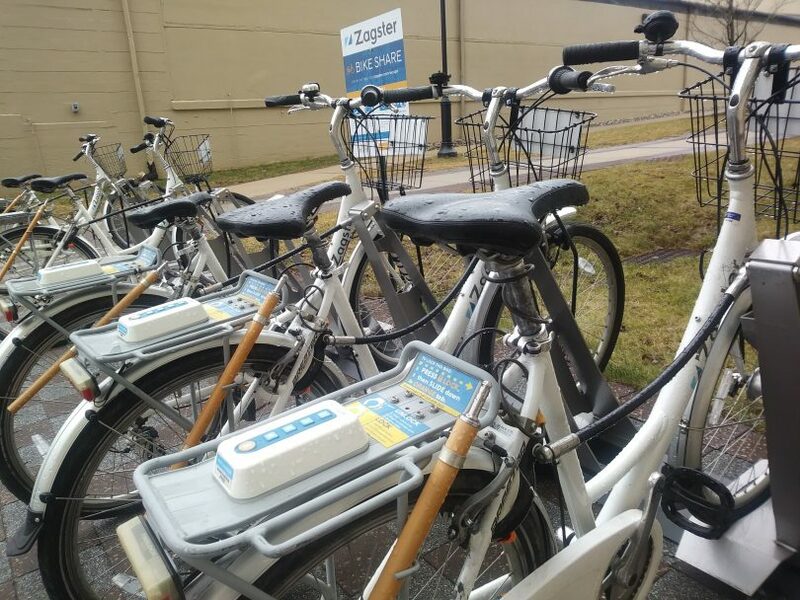 Zagster allows students to rent bicycles with a one-time, annual fee for up to three hours at a time to bike across campus or into town. With three stations on campus — one near Allegheny Hall, one outside Swope and one atop the hill outside Sturzbecker Hall — West Chester University has put $23,400 towards the program that started in 2016 in an effort to cut down on the campus’s carbon footprint as a part of the university’s climate action plan. The stations were chosen in a student survey conducted in 2015 that showed students would be most in need of bikes to ride between north and south campus as well as into town. Last semester, 281 people used the program through November. This was a significant increase from the 162 members that used the program the year before. Although ridership significantly increased between the first and second year, it has remained relatively steady ever since. Dr. Schedlbauer blames an “access barrier” or lack of awareness about the program and its operation for this plateau in ridership. “The hardest thing about the program has been to get the word out to people and to help them understand what the program is and how it works and how to access it,” Dr. Schedlbauer said. She noted that the program is somewhat unknown, partly because West Chester’s campus is suburban. Dr. Schedlbauer continued, “people haven’t necessarily seen bike-share programs before. If they have, they haven’t been in major metropolitan areas, so we need to do some education.” The transportation committee has tried to do some of that education by hiring a student-intern in past semesters to increase the visibility of the program. Dr. Brad Flamm, the director of the Office of Sustainability, hopes to gain support from the borough and the municipality for more Zagster stations around town. However, many residents of West Chester cited safety concerns with biking in the borough, saying that they feel unsafe due to the traffic and lack of bike lanes. Maddi Hunt, a junior and public health major at West Chester University who serves as an intern for the Office of Sustainability, also cited issues in that Zagster stations are currently only on-campus, making it difficult to allow students to use them for daily commutes. Despite this, she hopes that the office can make more students aware of the program and expand the use of Zagster throughout the community. To use the bike-share program, students can download the Zagster app on any smartphone. With the university’s discount code, “bikewcu,” students can purchase the $10 subscription that will allow them access to Zagster for the entire year. Students are allowed three hours per bike-ride and can return the bikes to any station. For more commuting and ridesharing options to and from campus, students are encouraged to explore West Chester University’s “WCURideAmigos” website at commute.wcupa.edu. Students can also visit wcupa.edu/transportation for parking and transportation information or contact the Office of Sustainability at sustainability@wcupa.edu.